Today, our marriage has reached the age of majority: twenty-one. Or it would be, if we lived in Mississippi. As we are in New York, we reached adulthood three years ago. But never mind that, because the real question is "what is the appropriate gift?" The thing is, the charts generally go year by year until year 15 or 20 - and then they start skipping. So 21? Who knows? McSweeney's to the rescue. According to their list of TRADITIONAL WEDDING ANNIVERSARY GIFTS FROM MEMORY, the gift for the 21st anniversary is ... hair. I could buy a hair mattress. A hair shirt. I went down a crazy rabbit hole looking for things made out of hair; there are surprisingly many very very strange items out there. But the single oddest and most intriguing find was a leaf. 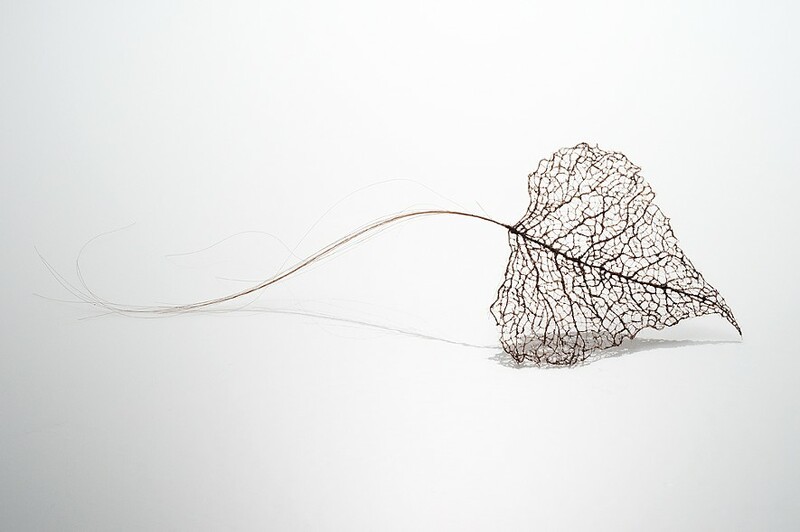 A textile artist works with human hair to recreate leaf skeletons, ineffably lovely objects. Happy anniversary, honey! I didn't make you a leaf out of my hair, but know that I was thinking of you! Whoa. So nifty. Even the picture of it works as a gift.